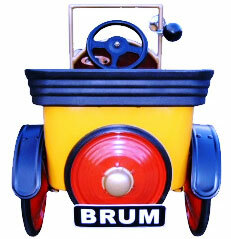 We are proud to present the first ever all steel Brum Pedal car. 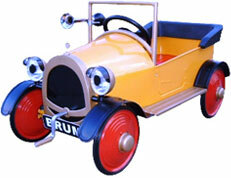 Lead free powder coated paint, all steel construction, solid disc wheels with duralast solid rubber tires, red padded seat, Brum's dashboard, black metal steering wheel, gold hubcaps, headlight shrouds with Brum eyes,a spare wheel mounted on tailgate, Brum's number plates, running boards, movable crank handle, a tooting horn and three position adjustable pedals that will allow child's growth. This car is licensed to BBC / Ragdoll Productions (Rosie & Jim), and has been strictly designed in close conjunction with the original car. Suite ages 2 - 5/6. inc vat & UK mainland Delivery. Sorry Sold out.